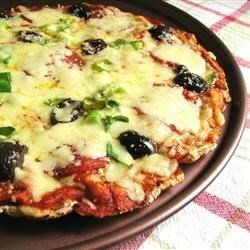 "'With its no-fuss pita crust, this pizza makes a quick meal for one,' says Jeannette Derner of Newport News, Virginia. 'And if you're serving a family individual pizzas are perfect--everyone can choose their own toppings!'" 1. Spread pizza sauce over pita bread. Top with pepperoni, mushrooms and cheese. Place on an ungreased baking sheet. Bake at 400 degrees F for 4-6 minutes or until cheese is melted. Nutritional Analysis: One serving (prepared with turkey pepperoni and par-skim mozzarella cheese) equals 275 calories, 6 g fat (3 g saturated fat), 25 mg cholesterol, 756 mg sodium, 38 g carbohydrate, 2 g fiber, 16 g protein. Diabetic Exchanges: 2 starch, 2 lean meat.